When it opened its iconic new gallery at 257 Bowery in 2010, Sperone Westwater staked its claim at the vanguard of galleries leading the Bowery’s renaissance. Designed by Pritzker-prize-winning Norman Foster + Partners, the sleek, translucent tower, while only 25 feet wide, provides great flexibility in exhibition space: the main gallery is located on the second-floor, double-height mezzanine, ideal for large sculptures and paintings; an intimate movable gallery is located in a 12-by-24-foot elevator, its bright-red exterior cabin visible from the street; and private galleries are on the upper floors. Skylights, windows, and glass doors provide abundant natural light, and award-winning use of custom gallery lighting completes the picture. 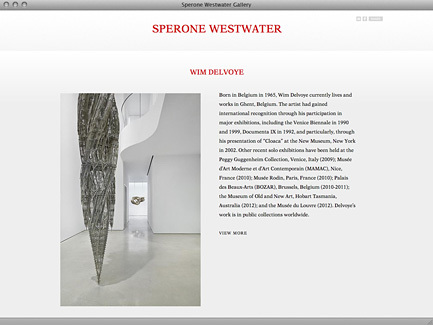 Our design for the recently launched Sperone Westwater website takes its inspiration from the gallery’s sensational eight-story building and big red box. It is a dynamic website with a beautiful sense of authority—deceptively robust and crafted using the principles of responsive design to ensure easy navigation and pleasing display across a wide range of devices, from desktop computers to tablets and smartphones. The site looks simple and clean, and, importantly, it respects and reinforces the gallery’s well-established and admired print identity, not only in its strong masthead and footer but also in the body of the website through the use of custom typography. The website uses nuanced tonal gradients to create a soft design framework, eliminating the need for lines and grids and imparting a sense of naturalness to the organization of the content. The website also incorporates the use of left/right image/text modules, a new strategy to help make extended editorial content less static and more visually appealing. The modules make it easy for gallery staff to add related images to editorial content anywhere in the site, with text wrapping pleasingly around the images. The use of custom typography results in a unified, refined feel to the website—it’s easy on the eyes. The first thing you see when you enter the website is a dramatic full-page black-and-white image of the gallery’s building, looking splendidly futuristic, as if lifted from Fritz Lang’s Metropolis. Centered at the top of the page, in Sperone Westwater’s signature New Aster typeface, are the words “Sperone Westwater” in red, all caps, superimposed over a full-page photograph of the gallery building. 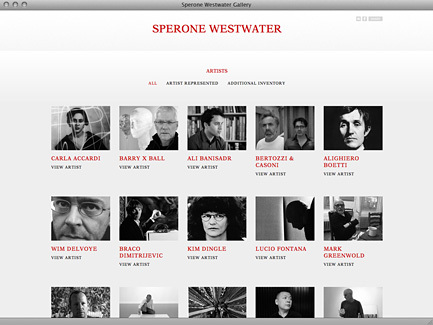 The six main navigation tabs (“Artists,” “Exhibitions,” “Catalogues,” “Art Fairs,” “News,” and “Gallery”) are centered directly under the Sperone Westwater name, again in red, all caps. The full-page background image changes every six seconds or so, cycling to images from the gallery’s current exhibitions and then back to the home image. 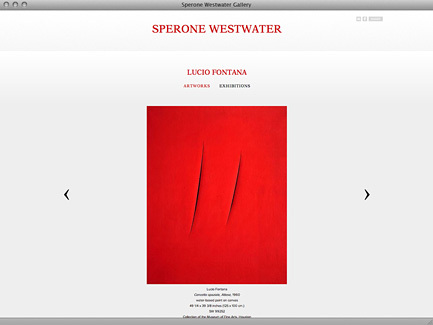 Scroll down to the foot of the page and you find the familiar and unwavering Sperone Westwater identity, centered in white type against a solid red background that occupies the entire width of the screen. At the top right of the screen are three sharing tabs—“Email,” “Facebook,” and “Share” (a tab that opens to more social-media choices). This basic design framework, spare and visually arresting, is used throughout the website. Click on “Artists” and you are taken to a page that provides links to each artist affiliated with the gallery. The links are arranged alphabetically on the page in rectangular thumbnails, five across, that include a photo of the artist and the artist’s name. Click on any photo and you are taken to the artist’s page, which includes images of the artist’s work, a biographical profile, and links to past and current exhibitions associated with the artist. You can scroll down the page to access each category of information or use the “Artworks,” “Bio” and “Exhibitions” tab to get there directly. Note that these categories are dynamic—they can be changed at the gallery’s discretion. A tab for video content might be added for one artist, while the tab for biographical content might be omitted for another. Whatever choices the gallery staff might make for an artist’s profile, sparse or packed with content, the page will display beautifully, not look orphaned or, conversely, cluttered. No matter where you are in the site, there are no dead ends. Information is organized in a continuous scroll in each section, allowing you to browse uninterrupted from top to bottom, without having to jump from page to page. Notice as you are scrolling through the site that the main menu locks and remains displayed at the top of your browser window, allowing easy and quick access to every area of the site. Click on “Exhibitions” and you are taken to the section of the website that contains information about the gallery’s current and past exhibitions. Here you’ll see large clickable thumbnails, each an image from a current exhibition, displayed boldly on the page, with information identifying the artist and the exhibition dates. Below that are links to the gallery’s past exhibitions, going back to 1975. These links are cleverly arranged by year, with smaller clickable thumbnails from the most recent year visible on the screen (four across). Choose a year and the thumbnails for that year’s exhibitions appear on the screen. Click on any thumbnail and you are taken to that exhibition’s page, where you are greeted with installation images from the exhibition, presented in a large panel that is about half the size of a computer screen. These images can be scrolled, left and right, using navigation arrows at the edges of the slideshow. (When viewing images of artworks and exhibitions in the slideshow, you can enlarge the view by clicking on an image.) Just above the slideshow is the name of the exhibition; under that are the navigation tabs for this subsection of the site, arranged horizontally. These tabs can be changed at the discretion of the gallery; they represent shortcuts to categories of content viewable further down the page. Click on the Emil Lukas exhibition (January 9, 2013–February 22, 2014), for instance, and you see navigation tabs for “Installations,” “Video,” “Press Release,” “Artists,” and “Press.” In contrast, the Web page for the gallery’s 2013 Alexis Rockman exhibition also has a tab for “Publications” but not for “Video.” Included on the page as you scroll down is the information in the tabbed categories, usually integrated into the page itself with generous use of images. Press releases and press reviews can be made available both in the body of the exhibition page and by pdf download. The functionality of the rest of the main navigation tabs is straightforward. Click on the “Catalogues” tab and you are taken to a page of exhibition catalogues available for purchase, arranged by date, each represented by clickable thumbnails that contain a photo of the catalogue. Click on a thumbnail and a large image of the catalogue is displayed, along with information about the publication. Moving to the “Art Fairs” tab, you are taken to a page devoted to art fairs in which the gallery participated. 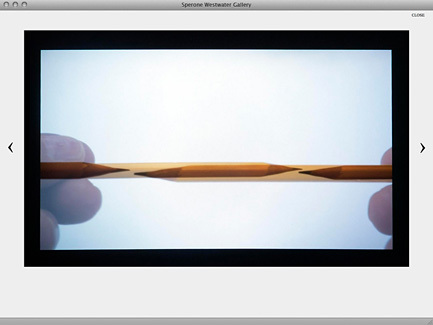 Clickable thumbnails reveal images from Sperone Westwater installations at various art fairs around the world. The “News” tab provides information about the gallery and the artists it represents. Finally, the “Gallery” tab takes you to a page that includes the location (with map) and hours of the gallery, contact information, a company profile, and a list of gallery staff. 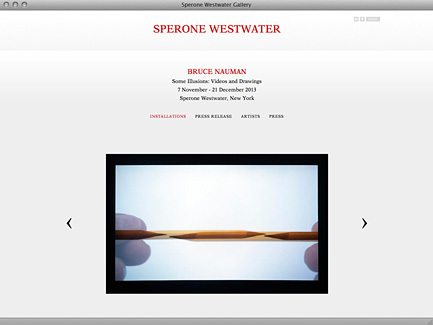 If you happen to use your tablet or smartphone to access the Sperone Westwater website, you’ll notice how natural the interface feels and displays—like it was custom-built for your mobile device. That’s because it employs responsive design techniques and best practices, allowing the website to query your mobile device to determine its limitations and optimal display capabilities, thus ensuring that data sent to the device is displayed appropriately. If you’re using the latest iPhone, for instance, the Sperone Westwater home page displays in a vertical orientation when the phone is held vertically, with the menu cascading down the page as a list of tabs. 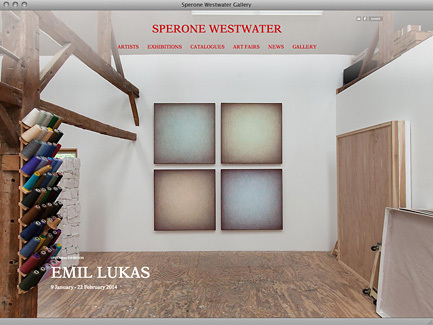 Turn the phone to a horizontal position, and the page will orient itself horizontally, appearing very much as it would on a desktop monitor, with the navigation tabs arranged horizontally beneath the Sperone Westwater logo. The site’s continuous scrolling feature is especially suited to mobile devices and has the added benefit of optimizing search-engine placement for the gallery. 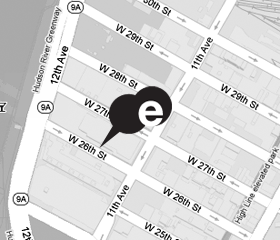 Day-to-day management of the website by gallery staff is simple and intuitive via exhibit-E’s Web-based content-management system. The website’s dynamic framework makes posting and managing images and editorial content easy. Simple, clean, responsive—these are the hallmarks of a first-rate website.